The last time I was on Mull, a weekend trip with Mrs L a deux, which if you are so inclined - and bored - you can read about here, we went for a walk on a nice headland. I took the scope with us, for I fancied that we might be able to see the sea, and generally the sea has seabirds on it. 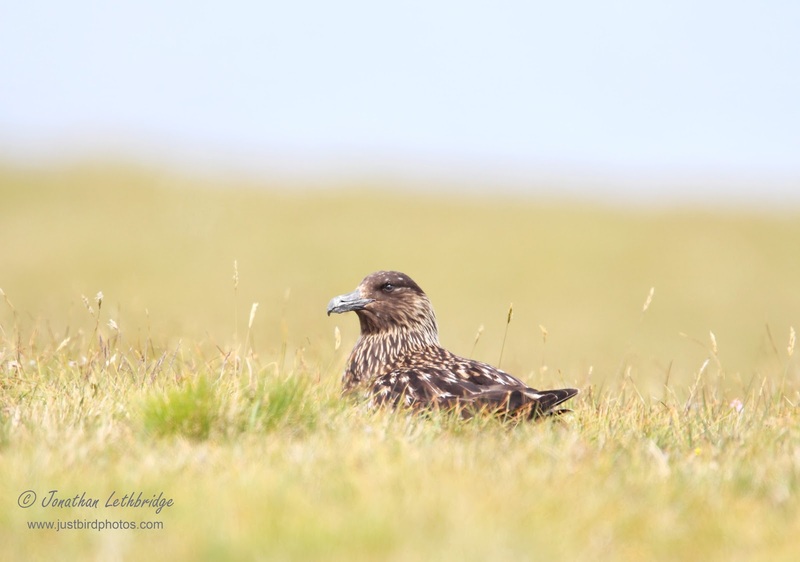 I felt certain I could get Mrs L to confidently see a Bonxie. It might be a dot in the scope, but it would be dark with white wing-flashes. I could brandish the Collins at her, and she could feel the happiness that only a tick could bring. 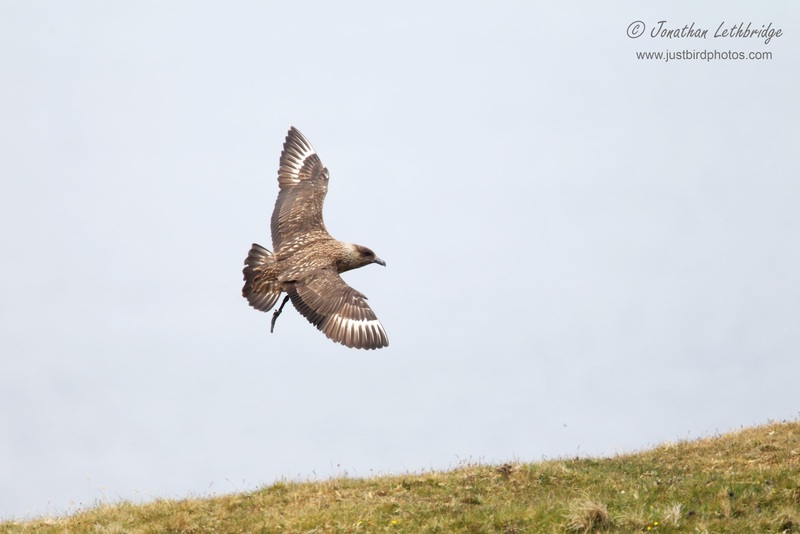 In the event a Great Skua flew right over our heads as we walked along, which at the time felt quite unusual but I thought nothing further of it. 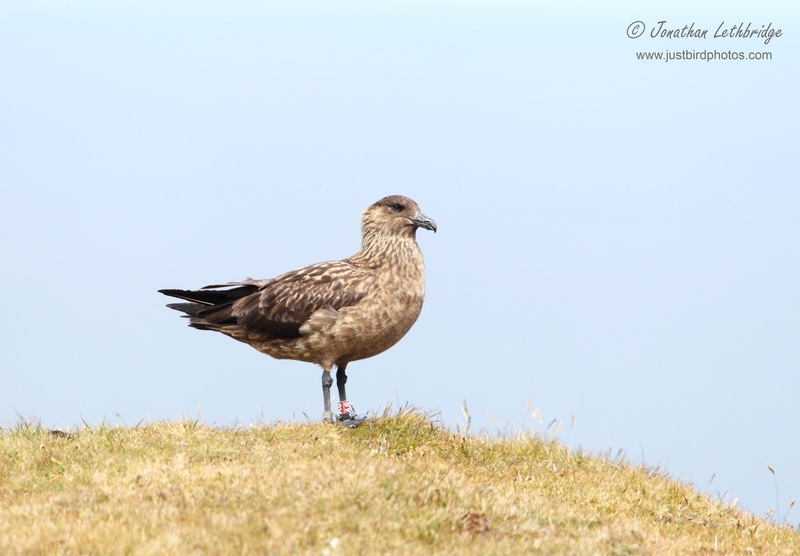 So when contemplating where to take Muffin for a boy's birding adventure, I idly wondered if a land-based Skua might not have been a breeding Skua. OK, so this is three years after the event but nothing ventured and all that. I vaguely remembered where this particular place was, so that's where we set off for. We dumped the car near a farmhouse, and set off for what looked like the headland I remembered, and bugger me if when we got to near the end there weren't a pair of Bonxies sat there. 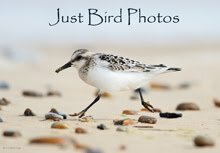 Whilst Muffin and I were extremely pleased to have stumbled upon them - exactly as per Mrs L's experience, what a great way to see a bird for the first time - the same could not be said of the Bonxies' feelings towards us. As we came over the brow, the male took off and circled around us, and as I tried to get the sun behind us, came straight for us before settling again. I nabbed a few photos, and we retreated to a safer distance. Back in 2009, we must have been somewhere slightly different, as we only saw a bird in flight, and didn't get warned off. Consequently, although the views were superb, they were very brief. This time we got scope views that were nothing less than sensational. Up close, Bonxies are magnificent. Their beaks are pure evil, and rather than the usual impression of "dark", they proved to be very gingery and patterned. Great noises too, nasal grunts and cackles, decidedly wicked I thought. We watched for a while, during which time the Skuas did very little, and then went back the way we had come, at which point the male got up and attacked us again, despite the fact we were leaving. I very nearly regurgitated a litte piece of fish from the previous night's dinner, but the charge was half-hearted and so I am here and able to recount the tale and show you the photos - the bird sat down is the female, presumably on eggs, whereas the standing and in-flight ones are the male. I had no chance to see if the bird three years ago was ringed, but I expect it's the same pair, and that they breed on Mull every year. A brilliant experience. Apparently these guys are a recent addition to the Mull breeding fauna although they bred on the Treshnish prior to this I believe. We didnt bother to see these guys due to great views on Lunga and also in Loch Na Keal but sounds like you had a great trip. 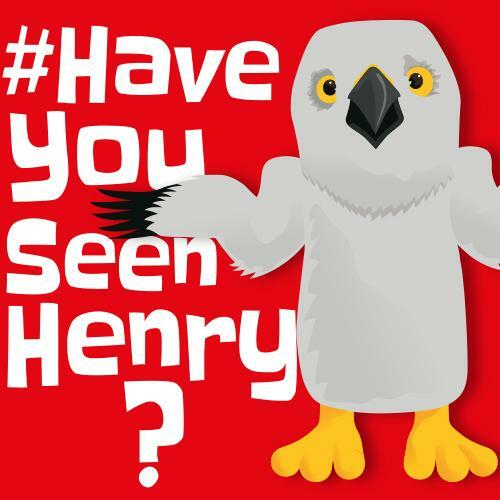 Did you manage to do the Mull Charters eagle boat?